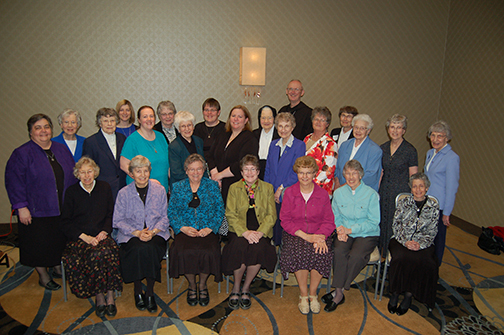 The Benedictine Sisters of Annunciation Monastery, Bismarck, hosted the Fifth Annual Sponsorship Formation event on May 15 at the Bismarck Radisson Hotel. Over 100 employees of the sisters’ sponsored ministries – the University of Mary, St. Alexius Medical Center and Garrison Memorial Hospital, discussed ways to deepen and share the Benedictine legacy. “Our effort is to touch as many employees in our sponsored institutions as we can with various opportunities for education and sharing on the call to serve as Jesus served,” explains Sister Thomas Welder, chair of Annunciation Monastery’s Sponsorship Council.